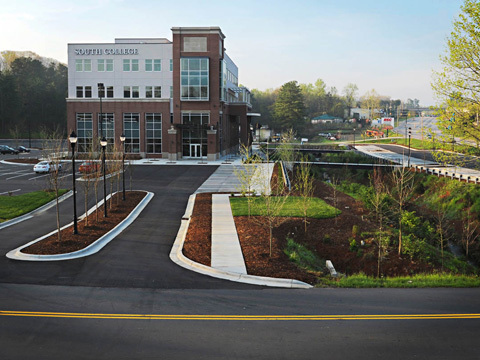 BEA provided comprehensive land planning, civil engineering and environmental services for the development of a 13 acre parcel for a new 40,000 square foot academic facility. The land planning incorporated the use of the onsite urban creek as an amenity. This minimized the regulatory impacts and allowed not only for timely delivery of the project but added a unique urban aesthetic. This also allowed for reduced stormwater management requirements. BEA provided comprehensive civil site engineering that included a detailed floodplain analysis as well as accommodating site environmental issues.